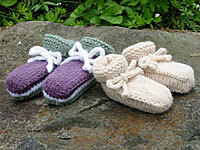 The Wave of Babies Booties are a quick, fun seamless project. The sole of the bootie is first worked back-and-forth in garter stitch. Then you pick up stitches for the foot and work in the round. 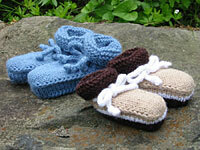 A ribbed cuff and an i-cord tie help make sure the booties will stay on baby’s feet. 01/11/2009: New pattern template, but no major changes to the instructions. Although this pattern is available free for non-commercial use, please consider making a small donation in support of the time and effort that went into this design. Thank you! Yarn Requirements: Plymouth Encore (75% acrylic, 25% wool; 200 yds/183 m per 3½ oz/100g). Solid-colored bootie requires approx. 60 yds/56 m in chosen color. Multi-colored bootie requires approx. 20 yds/19 m in each of three colors. It’s a Make 1 increase. You can use any of the m1 increases shown here on KnittingHelp.com. A kf&b would be fine too, if you don’t mind having that little bar show on the right side. These look so fun and easy. 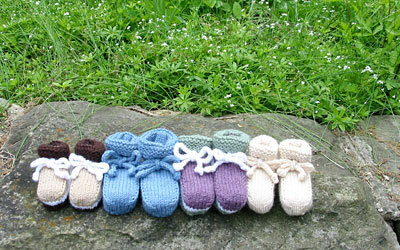 I cannot wait to knit some up for my grandbaby to be that is due at the end of this year….Thanks! Could you specify how many stitches per needle when you are picking them up? Im having a problem with the instep and I’ve a feeling it is how I am distributing them on the needles. Should I like knit the five and then pick up 9 more on the first needle, then pick up 7 and knit the 5 provisional on the second needle, pick up two more for the second needle and then pick up 14 for needle 3 or does it matter? I am disappointed in myself for not being able to figure this out. Sorry about that! I always knit on circulars so I don’t think to include these details in the pattern! It doesn’t matter a whole lot how you distribute the stitches. It’s probably easiest to k the first 5 on the first needle, pick up the 16(20) stitches on a second needle, k the 5 provisional on a 3rd needle, and pick up the rest on the 4th needle. You may have to transfer stitches from one needle to another as you work the decreases in the instep. I love these baby booties, but I keep getting a hole on either side of the instep before I start the yarnovers for the eyelets. Do you have any suggestions to keep this from happening. I think I must be doing something wrong. That happens to me too. I think it has something to do with the tensioning at that point. I just keep knitting, and then at the very end I go back and tug on the stitches on either side of the hole to tighten it all up. I get the same holes when I’m working regular socks, and do the same there. I hope that helps! When you come to the instep, slip the next stitch onto the right needle without working, bring the wool into the correct position for working that stitch ie back for knit, forward for purl,slip the stitch back onto the left needle and work it while at the same time pulling the wool quite tight. Repeat the exercise on the next row when you come to the other side of the instep. I guarantee this will solve your problem with a “hole” on either side of the instep. What a great tip! basically, do the “wrap” part of the wrap & turn maneuver ( from short rows ), right? Genius! I will definitely try this!